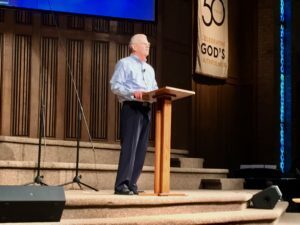 As PBC celebrated its 50th Anniversary, Tom Constable walked us through the Old Testament Book of Deuteronomy where Moses addressed God’s past faithfulness, Israel’s present obedience to God’s Law, and encouraged future faithfulness from His people. As we remember God’s past faithfulness, only love for Him will adequately motivate us to obey and follow Him today and in the days ahead. All that God does expresses His love for us. All that we do should express our love for Him.